No, that’s not click bait. That’s Marvel’s latest move. They’re making Steve Rogers, Captain America since 1941, into an agent of Hydra, the Nazi organization of the Red Skull. Now, I know what you’re thinking. If you read comic books, your first thought is that this must be: a clone / mind control / double agent / alternate reality / random comic gimmick here. But no, they’ve said that is it 100% not that. It is Steve Rogers. The man we’ve known and loved for decades, has now, and has always been, a secret Nazi agent. To keep it clear: this is MARVEL COMICS. This is NOT Marvel Studios. This is not the movies. This is not the beloved Chris Evans. This is not the film that just came out. This is the comic book. Which makes you wonder: who the hell green lit this? 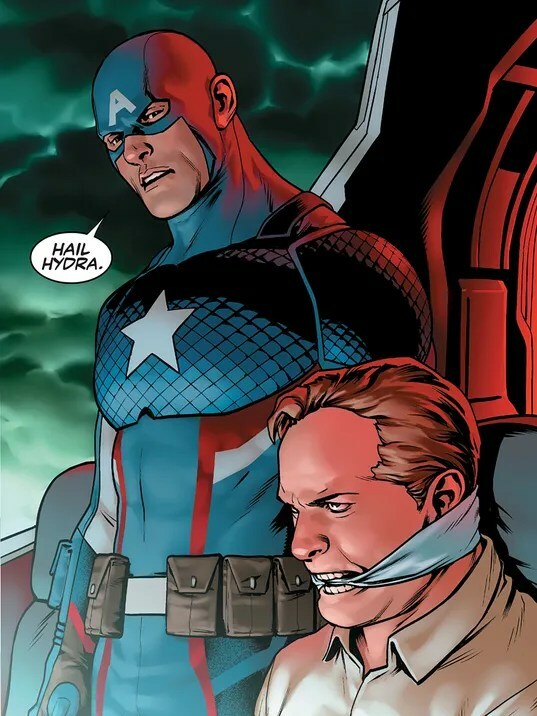 So of course, Steve Rogers as Captain America must be a right-wing fascist in comparison. Nope, it’s not even “in comparison,” it’s just a fascist. So he knows it would offend people and did it anyway. When did Marvel comics become so vile and corrupt that they cannot stand anything that looks like pure goodness? That they must be iconoclastic, even though they are smashing that which they made icons. I’m not suggesting that they are being iconoclastic without understanding what made him an icon. I’m suggesting that they know exactly what makes him an icon, and hate him because of that. Patriotism? No. Sam Wilson as Captain America has shown us the way there. Every pro-life, pro-God, pro-Christian, pro-American anything is automatically an evil caricature. Trusting in the inherent goodness of people in general and the American people in particular? People are evil and stupid, especially Americans. You have to wonder how much hate these people must have for goodness that they resort to insulting their own fan base and destroying everything they’ve ever worked for in this fashion? “Such reckless hatred makes the hatred-eaten man his own victim, and makes his mind his own dungeon and torture chamber. He claws out his own entrails and gnaws them. All good things […] become, for him, a cause of malice and pain. Sunlight to him is darkness, and life is nightmare. Captain America — and there is only one Captain America — is chock full of virtues, in every meaning of the term. And now, at long last, Marvel Comics have come to the point where they cannot stand virtue, or goodness, unless it is on their own, narrowly defined terms. Yes, the path to Heaven is also a straight and narrow path. But it looks like a superhighway compared to the “good leftists” of Marvel. I am grateful, however, to Marvel comics for at least inspiring a good movie franchise before they decided to take their comics to the dogs. Right now, my major occupational goals include becoming a big enough writer to go to Marvel, ask to take over a character, and from there, slowly take over the entire Marvel comic universe. Because even at my worst, teenage drivel, I still could come up with better material than this. This entry was posted in Analysis, Commentary, Fiction, News, Rants, Superhero, Writing and tagged Captain America, Declan Finn, Falcon, Hydra, John C. Wright, Marvel, Marvel Comics, Nazi, Nazis, Superhero. Bookmark the permalink. This is the worst thing ever. Not your comments — just the subject matter. Ugh. Lord have mercy, this is bad if not worse than them having Spider-Man sacrifice the existence of his unborn daughter to the Devil in order to heal his decrepit, probably-going-to-keel-over-soon aunt of a simple gunshot wound. At least Peter Parker can claim temporary insanity due to grief. Yeah, I’ve never understood the negativity towards the Lawful Good alignment. They are the characters I find the most fun to play and write about. They make tough choices and live with the consequences; they’re the ones who are fair and good simply because it’s the right thing to do. Most people think their character flaw is going to extremes, and sometimes that is the case, but more often the flaw for a Lawful Good character is a fear of making the wrong choice, which can lead to inaction, which causes more problems, and so on and so on. It’s spurs on such complex, dynamic stories, AND PEOPLE CALL THEM BLAND?!?! Captain America may be the best (and most awesome) example of a Lawful Good hero, but you know who else shares that alignment? Frickin’ Batman! Anyone want to call HIM boring or bland? Most of the good superheroes are lawful good, barring Author Stupidity. The Flash, for example, is not just lawful good, but lawful nice— he could be so incredibly scary…..
No, he did it BECAUSE it would offend people. It means he’s a subversive. He cannot create. He can only distort. Not seeing a difference in substance. When I started seeing this headline crop up, my first impression was that Marvel was officially out of ideas. Looks like I wasn’t far wrong. Ultimately, it’s Mass Effect 3 all over again: their IP, they get to decide how to tell their story. By the same token, though, when they tell a bad story, I have zero obligation to like it or continue to listen – and chances are, there’s someone out there willing to tell a story I *do* like instead. He could always make a deal with the devil to go back the way he was. These are modern (stupid) comics, after all. Well this will kill sales of older Golden, Silver, and Bronze age comics. People should troll Marvel and ask them why they are trying to normalize Nazis. Amen! Thank you so much for saying this!!! It is music to my ears!!! Did you hear what the Marvel VP of sales, David Gabriel, said in March? He got everybody in an uproar by saying that comic sales have dropped because people don’t want any more diversity or women in Marvel’s new comics. As if Marvel has ever lacked for either type of characters from its inception! Mr. Finn, if you DO get into Marvel and take over a character, please remember that there are plenty of other people who would like a shot at cleaning up the company, too! Get that foot in the door, and you will have an army of fans pouring through it to back you up in the fight!